Rotaxanes consist of macrocyclic rings trapped onto linear molecules by end capping the threading molecule with two bulky substituents. 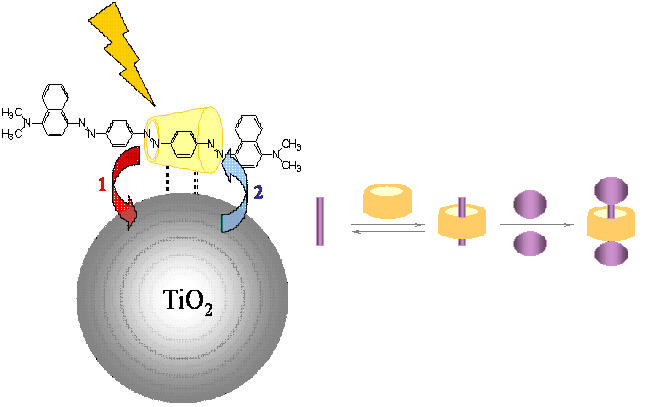 We synthesize and characterize rotaxanes based on cyclodextrins (cyclic sugars with 6, 7 or 8 glucose units) and are studying their optical and electro-optical properties with aim to make supramolecular devices based on them. The cyclodextrins have a hydrophobic interior and a hydrophilic exterior and thus improve the water solubility of several 'threading' molecules, say conjugated structures. In addition to improving water solubility which makes them candidates for say improving solubility of pharmaceutical compounds, these systems are ideal host-guest compounds forming model systems to receptor-substrate systems.. The architecture and specific molecular interactions provide ways of controlling luminescence, charge transport as well as chemical and mechanical stability in these molecular materials. We study the interactions and the photo-physical properties of our model compounds both to understand the underlying science and to provide material for making organic solar cells.